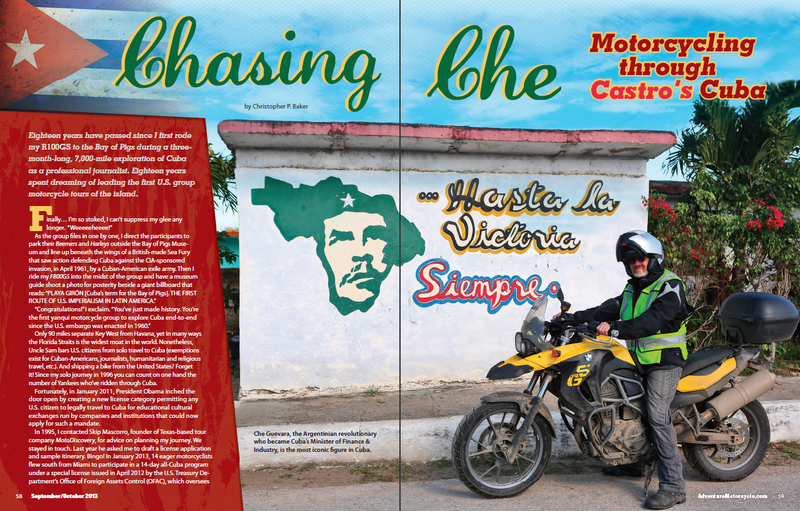 Adventure Motorcycle Magazine is about to publish its September/October 2013 issue featuring my self-illustrated article on leading the first group motorcycle tour of all Cuba for U.S. citizens since the Revolution. “Eighteen years have passed since I first rode my R100GS to the Bay of Pigs during a three month-long, 7,000-mile exploration of Cuba as a professional journalist. Eighteen years spent dreaming of leading the first U.S. group motorcycle tours of the island. As the group files in one by one, I direct the participants to park their Beemers and Harleys outside the Bay of Pigs Museum and line up beneath the wings of a British-made Sea Fury that saw action defending Cuba against the CIA-sponsored invasion, in April 1961, by a Cuban-American exile army. Hi Chris, tried to reply on your e mail but as previous it was refused. Would you try to check once again, why I am rejected by your server? Hi Michael… I don’t know why that would be. You’re not being shown as spam. I did get your Facebook comment.